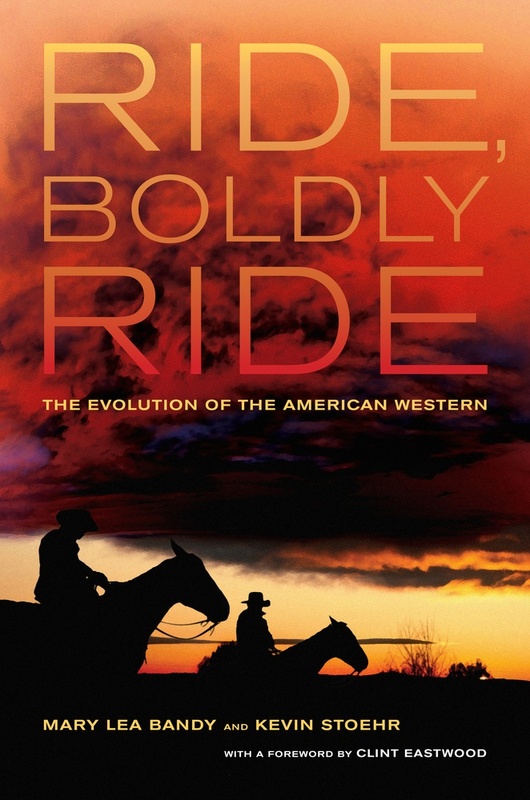 Not surprisingly, themes of landscape, Manifest Destiny, and the western character loom large in Ride, Boldly Ride: The Evolution of the American Western, but the book has an ur-theme that is not apparent to the reader until he reaches the very last sentence: “[T]he Western’s clearest expression of journey, adventure, and expansionism has been the journey, adventure, and expansion of the genre itself.” In its 280 pages of text, authors Mary Lea Bandy and Kevin Stoehr manage to provide interesting, substantive discussions of a surprisingly large number of films. If they occasionally seem distracted by tangential issues, exercise questionable judgment on what films to highlight, rely too much on the opinions of other scholars, assert without explanation, seek lessons in films, and overlook a film’s most emotionally powerful moments, the cumulative effect of reading the book is an enriched comprehension of the Western’s variety and evolutionary continuity, a sense of the unity that comprehends the genre’s diversity. The book’s structure is a bit disjointed, in that there is not a clear trajectory linking chapter to chapter, topic to topic. A chapter on women in the Western dwells almost totally on The Wind (USA 1928). A chapter on the comic Western not merely chooses to focus on Ruggles of Red Gap (USA 1935) but within this discussion digresses at length on the career of Leo McCarey. One chapter compares two Westerns Howard Hawks made with John Wayne (Red River [USA 1948] and El Dorado [USA 1966]), with Wayne’s persona as a main focus, while another examines two Westerns John Ford made with John Wayne (The Searchers [USA 1956] and The Man Who Shot Liberty Valance [USA 1962]), with their aesthetic excellence as the reason for pairing them. The authors often invoke established scholars and critics such as Bazin, Kitses, and Wollen, among several others, to make a point. Their readiness to do so suggests a lack of confidence in their own critical discernment, but it benefits the reader. The quotations are usually interesting and remindful. They flesh out the authors’ often-tentative interpretations. And occasionally the authors take on the critics they cite, sometimes by adducing a second critic in rebuttal. In these brief squabbles, they win some and lose some. In one victory, the authors first quote a view (of George Fenin and William Everson) that Northwest Passage (USA 1940) is racist because in it the Indians are described as vicious and savage and then counter with a quotation from Susan Glover that points out, accurately, that while the Indians’ savagery is merely reported in dialogue, we actually witness acts of horrendous savagery committed by the whites (113). They lose, in my view, when they counter Jim Kitses’ argument that the intended critique of violence in Unforgiven (USA 1992) fails because the film has made us want to see Will Munny slaughter a lot of people. The authors blame the audience (and Kitses): “If we find any genuine heroism in Munny’s violent killing . . . it is probably we who should become the object of criticism, not Eastwood or his film” (268). But Kitses had not argued that we find heroism in Munny’s rampage, only that we want to see it. The authors exhibit a puzzling tendency to find life lessons in Westerns: “[The Man Who Shot Liberty Valance, The Seachers, Red River] instruct us in the nature of legal authority” (202); Boetticher’s film “reminds us that humans are by nature autonomous” (217); “Many of the midcentury Westerns teach us such a lesson. . .” (226); Unforgiven “provides another profound lesson about mythmaking and the falsehoods. . .” (265). They make unsupported claims. Here and there they assert that the revisionist and postmodern Westerns reveal the truth about the West, debunking its mythology. But nowhere – or rarely – do they provide evidence for this claim outside the films themselves. How then can they tell when a film is presenting an accurate depiction? The gunman draws. Dunson is faster and kills him. That’s that. It’s easier to criticize this book than to praise it, because its flaws are specific while its strengths are cumulative. This is an energizing, useful book. It provokes the reader to talk back to it – and to re-see some Westerns. And it succeeds, finally, in conveying a sense of a causal continuity in the genre’s development over the past century-plus, a recognition that most Westerns are aware of the Westerns that have preceded them.